How To Administer Nasal Spray To Kids? Can Allergic Nasal Sprays Affect Kids' Growth? While most of us, especially the kids, look forward to those lovely winters, the weather can often play spoilsport before the season even sets in. The kids are the worst off, as their underdeveloped immune system cannot fight the cold or the flu. The only realistic course of action is to administer some nasal spray to your kid. But, are they safe for your little one, can the use of nasal spray lead to complications? 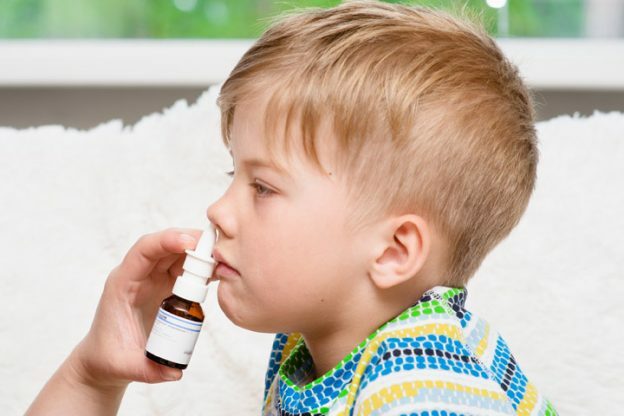 Read our post below to learn more about the use of nasal spray for kids. Nasal congestion is the most common symptom of the cold, an allergy, or even a change in the weather (1). Whether your child is 4 or 10, as a mom, you will most probably panic if your child is unable to breathe. But, don’t worry! Nasal congestion isn’t a cause for concern and is quite common among kids of all age groups. A basic saline spray for children is all you need to treat a stuffy nose (2). While you can make a saline solution at home, it is advisable to buy an OTC nasal spray to avoid any other infections. An OTC nasal spray is typically made using a salt water solution, and it loosens excess mucus in the nasal passage and moisturizes it, and makes breathing less difficult. These solutions or nasal sprays for kids can be easily administered once in 4 to 5 hours as and when needed (3).However, you should consult your child’s pediatrician before trying any medication (4). Hold your child in a sitting position and support his head using one hand. Use the other hand to squirt the drops into one of the two nostrils. 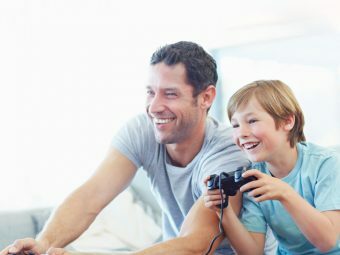 Guide your child to lift or tilt his head backward so that the drops go in. Allow the spray to work its wonder by moistening the entire nasal passage. This can take a few minutes. Once the mucus loosens, help your child to blow his nose. 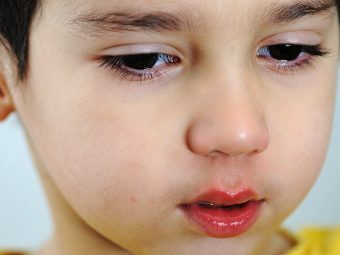 Most pediatricians do not routinely recommend decongestant or nasal sprays for younger kids as the side effects are much lesser when medication is administered locally and doesn’t get into the body. Even if your child does tolerate squirting of the spray up the nose, the solution may offer only temporary respite. Doctors say that the solution will narrow the blood vessels in the nose that help shrink the tissues around and opens up the nasal passages (6). However, with prolonged use, the child will suffer from a “rebound” effect whereby the blood vessels will swell up, and the whole area will get blocked, leaving the child more congested and restless (7). Several cold medications sold in pharmacies or drug stores do not treat the cause of the cold. These medications only alleviate the symptoms of a bad cold to some extent. Most doctors suggest the use of a vaporizer or an effective humidifier in the room during bedtime, which naturally increases the amount of moisture in the air (8). The humidity will help loosen the mucus and clear the nasal passages. 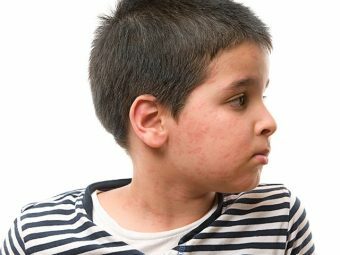 Can Allergic Nasal Sprays Affect Kids’ Growth? Some children are forced to resort to the use of a nasal spray to alleviate the symptoms of an allergy. These steroid sprays can suppress childhood growth to a considerable extent. Nasal sprays help treat allergic rhinitis, which affects around 10% of all kids. Nasal spray for children are often the first line of treatment for allergic rhinitis as they alleviate the symptoms and provide relief (9). Studies suggest that child nasal sprays that contain beclomethasone can slow down the growth rate in young kids (10). On the other hand, a new treatment that involves the use of Nasonex as an active ingredient in the spray is deemed to be harmless (11). While doctors and researchers are still at loggerheads over the safety of using these drugs for young kids, it is better to be safe than sorry. In short, do not overuse a nasal spray, especially if your child is between 4 and 6. Kids older than 6, are more resilient. However, it is still suggested that you limit the use of nasal sprays. 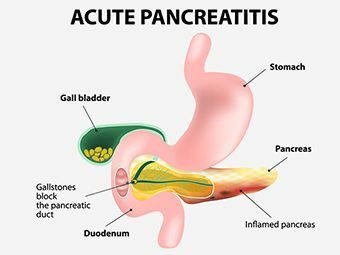 Instead, opt for safer and more natural remedies that don’t just alleviate the symptoms, but also relieve discomfort without any side effects. Breathing in steam moisturizes the nasal passage and loosens the mucus (12). Using a humidifier or cold mist vaporizer in your child’s room can help relieve his congestion in a couple of days. Alternatively, you can steam up the bathroom and let your child sit inside for a few minutes. If your child is four years or above, you can use eucalyptus oil, which will produce a cooling sensation and decongest your child’s chest and nose.Just dab on your child’s nose and it will open up the breathing passage. Consuming warm fluids also help in decongesting the chest. Make your child some chicken broth or soup. You will be surprised at how soon the congestion will be gone. Warm liquids, chicken soup, especially, can do wonders in treating a congestion naturally. It also will drive away other symptoms like tiredness and fever, and you will see your child smiling in no time at all. These simple tricks will help your child get past the stuffy-headed misery and breathe easier. If the cold gets worse or your child is less animated than usual, you need to rush him to the hospital immediately and never self-medicate. Do you use kids nasal sprays to relieve congestion? Tell us here. Is PediaSure Good For Kids?